The photo was made on December 10, 2017 at 4:59 PM. This photo was taken in my home in Bethesda, Maryland. The "Take It!” decision was only a matter of deciding how to stage the catch. The season referred to in the title is that of hunting for homeless hats and scarves as people somehow drop or lose them as these cold times take over the weather picture. This first hat was found in the street near the Convention Center in Washington DC. It was brought home and washed in my clothes washer using a mix of Simple Green and regular Tide. It was then hung up to air dry. Searching for a surface to make the photo from - I resorted to placing the dried hat on top of a down comforter which was in its final drying stages and draped over my stationary bike, which I have not been able to use - up until now due to the progression I had to follow after having had surgery on my shoulder. I happily was given permission to return to using the bike for strengthening my legs, but no heavy arm usage as of yet. Since taking the photo I have "rescued" two more hats and will continue to accumulate them to take to the actual homeless shelter for distribution. They always are happy to get them. Having been at this "No Permit Needed" sport for over 3 years I must say that one must be very careful when picking up the "catches" as the weather can have people not driving with the same kind of attention given as is in nicer weather. 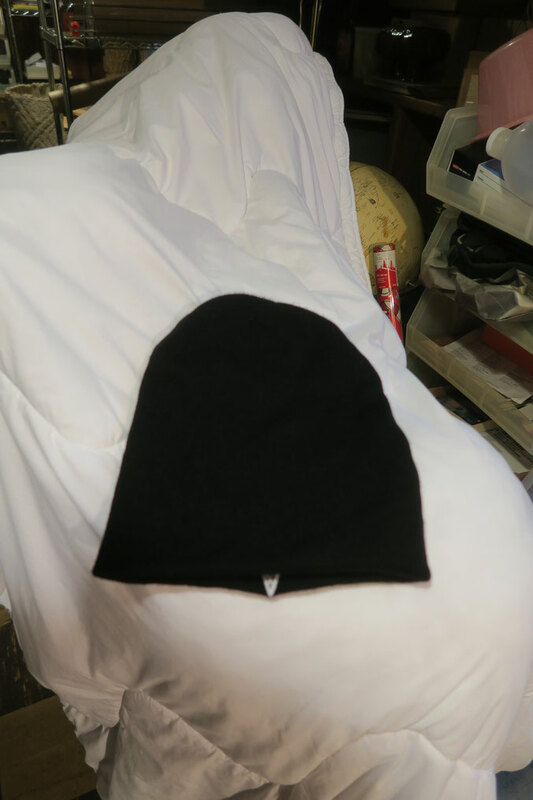 Should you not have a homeless shelter where you live - it could be a good idea to take the washed items to a middle or high school for them to give out to children who may either not have a hat - or lost or forgotten to wear one on a cold day. This will be one of my very few "Public Service" entries. Hoping everyone is where they can either be or get warm, as this cold snap makes its way through its course. PS: For those who look very closely at the photo attached - they will see a hint of a point near the under edge. That is the bottom tip from the star used by our dreaded rivals - the Dallas Cowboys. This hat will also be welcomed wherever it is offered as we have a surprising number of Cowboy fans in this area. That is really an awesome thing you do. Especially in an area that gets as cold as yours. Boy a Cowboys beanie can't be too popular right about now. Lol. Do you ever see any you like and keep them? Aww what a sweet story, what a wonderful habit. I bet a lot of homeless out there don't know they have your work to thank. Do you ever get any other articles of clothing? T shirts or sweaters or anything? Hi Teri: Thank you for your kind complement. Odd how this game affects me. I am happy to find a hat or a scarf, and at the same time, I have a touch of sorrow for the person who lost it, not only for the loss of what may have been a favorite or long time possession, but also that they had to endure the cold from not having the item any more. Hi: SF1967 Surprisingly enough, there are quite a few Cowboy fans in this area. A lot of fandom is passed along in families. A little known fact about the DC team, is that the original owner of the team, was the very last owner to hire Afro Americans as players. He had to get over what it was that held him back for in time he saw he was missing out on enormous talent and relented. While he was making up his mind - many in this area chose the Cowboys as their team of choice as an alternative, and a way to show this owner their displeasure. Even though that happened some time ago - there are more than a few who have remained fans of this alternative team. Hi Jim: Yes, I now keep some that are exceptional. In the beginning - I gave them all away. Some were really cool. Like with many endeavors we refine with time. Hi Sally: Thank you for your kind complement. The fun of the hunt, along with the give away to a great cause, is a big reward and all that I need. Hi Yuppie7: I am very careful to pick up items which do not have a hint of having been placed or put down with the intention of returning to pick it up. The street is where I get most of the prizes. Thanks for your concern. Hi Gabe: I specialize in knit hats and scarves, but have on rare occasions picked up a stray sweater or baseball type of hat. Thank you and best regards to each of you.